Ripper Street Season 2 is set to air on BBC1 Monday 28th of October. Whitechapel H Division is responsible for policing one and a quarter square miles of East London: a district with a population of 67,000 poor and dispossessed. 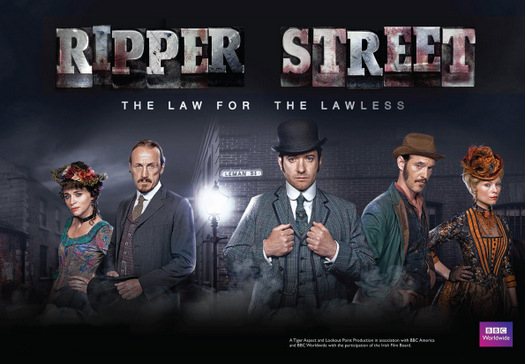 Among the factories, rookeries, chop shops, brothels and pubs, Detective Inspector Edmund Reid (Matthew Macfadyen) and Detective Sergeant Bennet Drake (Jerome Flynn) team with US Army surgeon and former Pinkerton agent Captain Homer Jackson (Adam Rothenberg) to investigate the killings. Each episode features stand-alone crimes that serve to test Reid, Drake and Jackson, both in their working and private lives. First episode a new decade dawns on Whitechapel, and now in 1890, Jackson discovers a new opiate on the streets of Whitechapel from the nearby newly emergent Chinatown in K Division, Limehouse, led by the amoral Detective Inspector Jedediah Shine. Ripper Street Season 2 was coordinated by Guilds Gee Nagys. Roger Yuan also choreographed the big boxing fight. Gee was joined by Aoife Byrne, Brendan Condren, Conor Hegarty, Darron Costello, Eimear O’Grady, Gerry Behan, Keith Ward, Norman Kelly, Paul Thompson, Peter Dillon, Philippe Zone, Phil Lonergan, Roger Yuan and Stav Dvorkin.